The new ASC 606 accounting standards will take effect for all US-based private entities with reporting periods after December 15, 2018. Public entities and international businesses under IFRS jurisdictions were subjected to these changes a year earlier, meaning that by 2019, almost every business across the globe will be impacted. These changes may seem to only affect finance teams, but there is much more hidden below the surface. How go-to-market teams structure, optimize, and negotiate packaging and pricing will soon have downstream implications. Cross-functional teams need to work together to create efficient workflows that remove bottlenecks and ensure compliance. 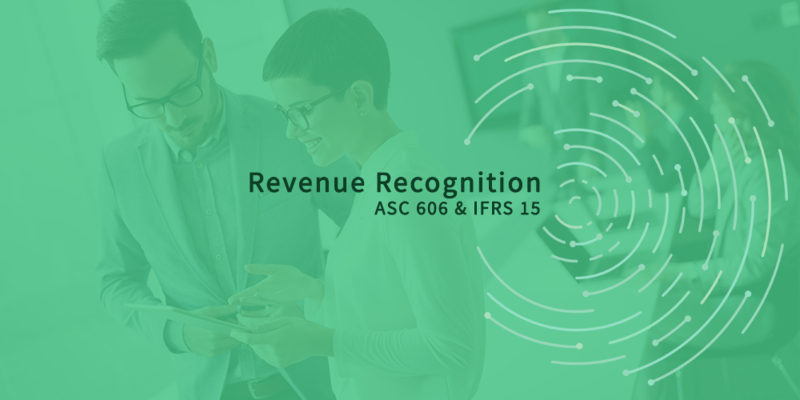 To get you ready, we wanted to provide some high-level, need-to-know information around how the new standards will impact subscription businesses in 2019, and what we’re doing to help these businesses implement ASC 606/IFRS 15 compliant revenue recognition reporting. Disclaimer: Before we jump into the post, we want to point out that the information below is meant to be informative, but you should consult with your company’s finance team to determine what these changes mean for your company. So what is ASC 606 & IFRS 15? Revenue is one of the core elements of a financial statement, yet there have historically been many different ways that companies have recognized revenue. The Financial Accounting Standards Board (FASB) and International Accounting Standards Board (IASB) identified this misalignment as a serious issue. The two organizations collaborated to create a global standard that aligns how companies recognize revenue from contracts with customers. So what does this mean for companies with subscription offers and how they recognize revenue? The two Boards created a five-step approach that you can apply to determine the amount and timing for how to recognize revenue with any given contract. If you are looking for a more detailed explanation of the five steps, check out these great resources from Revenue Hub and Deloitte. The officially issued updates in their entirety can be viewed on fasb.org (ASC 606) and ifrs.org (IFRS 15). Forewarning, the official updates are hundreds of pages and are not for the novice accountant. Please consult with your finance team or CPA. Why are subscriptions under a magnifying glass? In the past, companies with subscription offerings may have chosen from a broad set of revenue recognition rules to keep their accounting simple. Unfortunately, that is not going to work with the new ASC 606/IFRS 15 standards because of the many subscription billing events that can take place throughout the life of any given subscription. The key thing to realize is that you must define different revenue recognition rules for the different types of fees based on the five-step approach above. Subscription businesses are very familiar with this kind of revenue, as it’s usually the primary fee that consumers pay to use your service. For many businesses, this is a simple monthly fee that is extremely easy to recognize. But it’s not always clear-cut when offering annual contracts, multi-term discounts, or extended payment frequencies. For example, if you have a $1,000/month product but negotiate an annual contract for $10,000 that is billed quarterly. In this case, you contract amount is $10,000, but you will be collecting $2,500 every three months, and only recognizing a third of that each month. The prepaid subscription fees must recognize revenue on a schedule—not all at once—as your product/service fulfills the performance obligations. Usage-based fees have increased in popularity because of their ability to scale and align pricing with value. With this model, customers can’t be billed until the end of a period when consumption can be calculated. For example, if you have an SMS marketing platform, your customer will pay for how many text messages they sent out during the previous month. While they may have a ballpark estimate of the amount, It’s not truly known until the end of a period and will vary from period to period. While billing is done in arrears, revenue will need to be recognized for the period that when the consumption took place, not when it’s billed. Every company uses one-time fees differently. It could be for onboarding/integration assistance, customer development work, or even a prepaid block of credits that can be used over the course of a subscription. In most cases, these fees are typically ad hoc and used for add-on services such as implementation, optimization or tuning. In any case, you’ll need to compare each fee to the five-step checklist to determine when revenue should be recognized—all at once or over a period of time. With ASC 606 and IFRS 15, companies need to break down every revenue-generating line item of a paid invoice because each one may be recognized in a different way. While mixing and matching options to tailor plans for buyers is great for maximizing recurring revenue, it’s a finance team’s worst nightmare under the new standards. Go-to-market teams like product, marketing, and sales will need to work more closely with finance to ensure that complaint revenue recognition reporting isn’t a mere afterthought. How is Chargify helping teams become compliant? In preparation for the impending 2019 changes, many subscription billing vendors have launched basic revenue recognition reporting—with emphasis on the word basic—that still require time-intensive, headache-inducing spreadsheets. We believe that your subscription billing platform shouldn’t limit creativity when it comes to how you want to structure offers and bill customers. The same mindset now applies to how you recognize revenue according to ASC 606/IFRS 15. Over the last year, we’ve been working hard to deliver an innovative, future-proof revenue recognition solution. A solution that has been purposely designed for modern subscription businesses that constantly experiment, optimize, and personalize offers. We feel like we’ve found the solution, and we’ll be sharing more with you very soon. Like a fine wine, some things are well worth the wait. Current Customers: Sign up for our early access, closed beta program. UPDATE: We acquired revenue recognition software ProRata. Read the full announcement.